Trump genius at work! Issue bonds to finance the border wall, bypassing Congress. Make it a solar farm to sell electricity to US and Mexican consumers. The wall keeps out illegal immigrants and pays for itself. Win-win! Genius! Trump is a genius! claims European Union Times. A “big, beautiful” wall between the US and Mexico is coming soon and could produce clean energy, the president stated Wednesday. 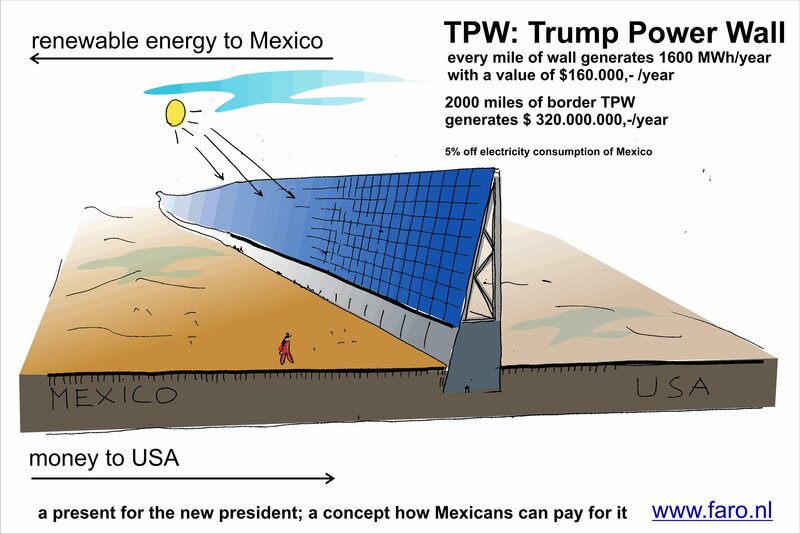 So the wall will have two big purposes now, giant clean energy generator and keeping the invaders away. Trump can also give some of the energy to Mexico for free. That way he will make Mexico agree with the wall and never want to tear it down in the future because it would benefit them as well. Give Mexico like 5% of the energy for free. Speaking at a rally in Iowa, President Trump reiterated his plan to build a southern border wall and proposed incorporating solar panels in order to lower the structure’s cost. “Yes we will build the wall, we’ve already started planning. It will be built,” the president told the Cedar Rapids crowd to tremendous applause. The president has long insisted Mexico would ultimately end up paying for the wall, and he argued adding solar panels could help decrease the nation’s burden. “This way Mexico will have to pay much less money, and that’s good, right?” Trump said. It’s been estimated the wall could cost anywhere between $12 to $70 billion, though the DHS has put the cost at $21.6 billion. “I mean actually think of it: the higher it goes, the more valuable it is,” Trump added jokingly. Axios reported earlier this month that Trump had discussed plans to add solar panels to the wall during a meeting with Republican leaders. 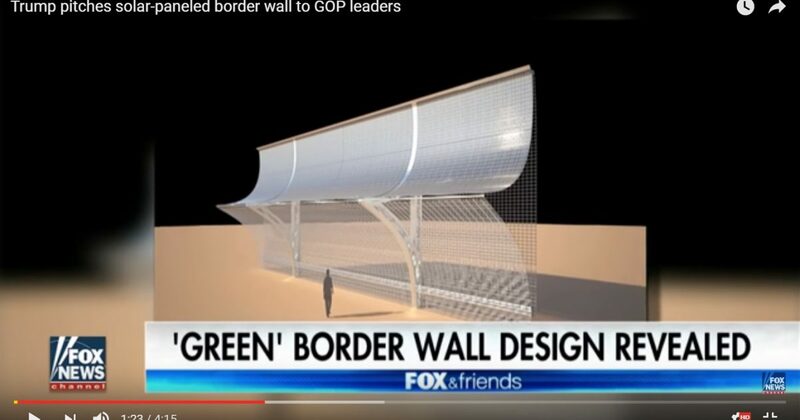 “Trump said his vision was a wall 40 feet to 50 feet high and covered with solar panels so they’d be ‘beautiful structures,’ the people said. The President said that most walls you hear about are 14 feet or 15 feet tall but this would be nothing like those walls,” reported Jonathan Swan. In April, as many as 450 companies submitted designs to be considered for the 2,000 mile wall, which would stretch from Texas through New Mexico all the way to California.